Code metrics can be a very useful tool for monitoring some aspects of code quality. To get the most out of it you need to calculate the metrics on a regular basis in order to find trends. Code quality tend to go down during intense phases of a development project and also when a product is in low-intensity development, a.k.a the maintenance phase. The obvious thing to do for a modern developer is to integrate calculation of code metrics into the Continuous Integration process. In this post I will demonstrate how you can calculate code metrics and display graphs of the evolution over time as part of your Continuous Integration process. 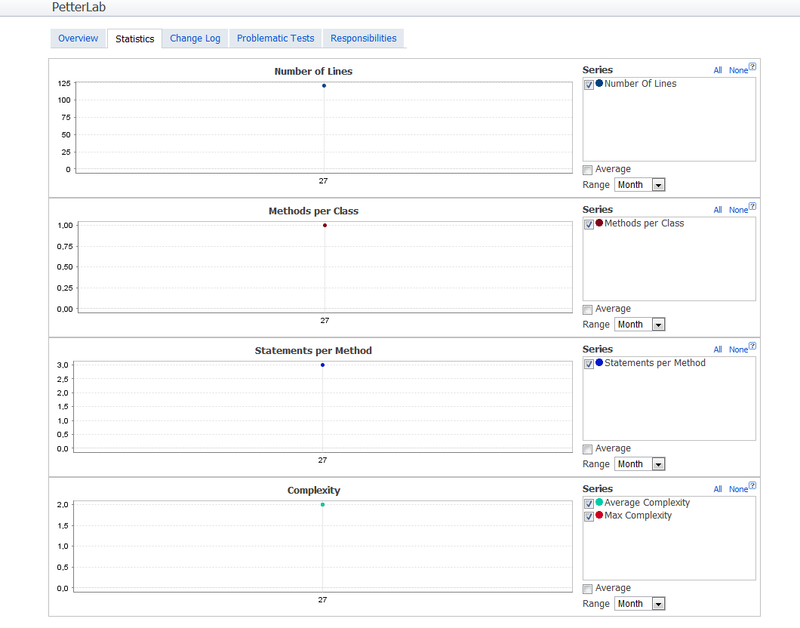 There are a few tools available for calculating code metrics in .NET, the most capable is without doubt NDepend. Here I will use another tool, SourceMonitor, which is free of charge and very lightweight. We use Team City at work, so that is the CI server that I will use here also, but you could probably implement this idea in the CI server you are using. One of the goals I had when I started experimenting with code metrics statistics was that I wanted it to be easy to add statistics to any project, without changing anything in the project itself. All changes should be in the Team City configuration. I put all the files in a directory called SourceMonitor. This command file will create two xml-files: SourceMonitor-details.xml and SourceMonitor-summary.xml. It is from the latter that we will extract the values to publish to Team City. The next step is to create a new build configuration for the project that you want to analyze and display statistics for. Attach your VCS project root and the SourceMonitor root as well. Your version control settings will look like the example below. 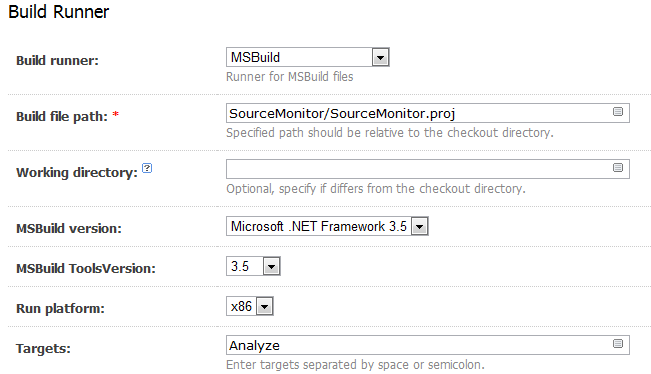 Configure TeamCity to use the MSBuild runner for your build and specify the path to the build script that will run SourceMonitor. Also specify the target, in my case “Analyze”. Setup build triggering the way you like it, either as a dependent build or scheduled at some interval, for example every night. SourceMonitor only supports a few metrics, so if you want some more advanced metrics, like code cohesion, then go for NDepend. In this post I haven’t explained how to display detailed reports from SourceMonitor in TeamCity. Maybe that will come in a later post. Good luck with your metrics! We have started implementing Contiuous Integration at our company. We began with Cruise Control.NET but have decided to try with TeamCity instead. One thing that we would like to do is to deploy ASP.NET web applications as part of our Continuous Integration process. We use the Web Application Project template in Visual Studio. One problem that we faced was: How can we copy all the neccesary files to the web server? We didn’t want to specify the files explicitly nor did we want to copy all files with certain file name extensions. Those approaches seemed very error-prone. The first approach we used with Cruise Control.NET was to use the MSBuild target _CopyWebApplication which is defined in Microsoft.WebApplication.targets. I was not very pleased with this solution, although it worked. My main concern that we didn’t have any control over the process. When we started with TeamCity it turned out that this approach was not working anymore. The _CopyWebApplication target copies all files needed for the web application to a directory called _PublishedWebSites\<web application project name>. For some reason (probably a good one), TeamCity mangles the name of the project file, with the effect that the name of the directory where the web application files were copied to had a different name than expected. So I decided to try another approach. Since I like NAnt much more than MSBuild, I started to explore if it was possible to use NAnt for this task. The main problem was that the valuable information on which content files were part of the application was buried in the project file. To utilize this information I used an XSL transformation to transform parts of the project file (which is an MSBuild script) into a NAnt script. Hence they can be selected with the XPath expression: /Project/ItemGroup/Content. A target which copies the files in the fileset to some directory defined by a property. Of course there are several other ways of accomplishing this, like using a Web Deployment Project, but I personally like having full control of what is going on and that can be achieved with NAnt.